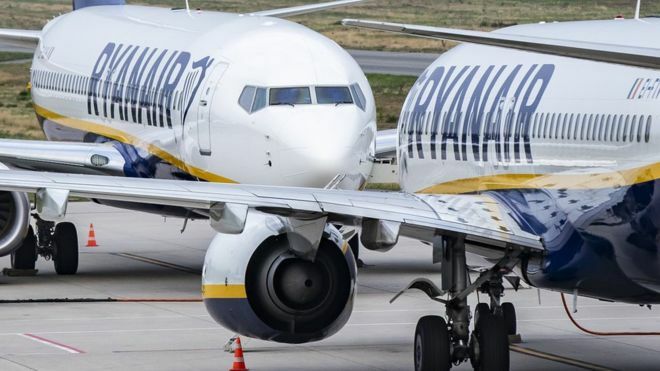 The Civil Aviation Authority (CAA) has called on Ryanair to compensate passengers affected by staff strikes this week. The CAA argued Ryanair was bound by EU law, but the airline said it would reject any claims. Ryanair has cancelled 150, or about 6% of its 2,400 scheduled flights this Friday. The airline said this was due to strikes in Spain, Belgium, Holland, Portugal, Italy and Germany. About 24,000 customers have been affected, a Ryanair spokeswoman said. Under EU Regulation 261, travellers are entitled to a refund or new flight if their trip is cancelled. Compensation of between €125 (£110) and €600 (£540) can also be claimed if a flight is cancelled within 14 days of departure and if this is deemed to be the airline's fault. This includes staff strikes.